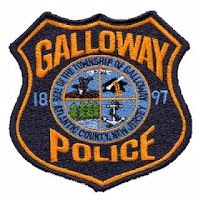 Galloway Township Police responded to 1510 calls for service during April 20, 2014 through May 3, 2014. Additional statistics include: 6 Burglaries, 30 Motor Vehicle Accidents, 92 Tickets issued, 1 Driving While Intoxicated, 15 Arrests, 26 Domestic Violence,34 Fire Calls, 194 EMS Calls and 3 Juvenile calls. 4/24 N. New York Rd. Ashley E. Defoe 26 of Galloway was arrested by Cpl Chris McGinty for DWI on 4/27/2014. Patrick J. Sharpe Jr. 27 of Egg Harbor City was arrested by Officer Jackie Crocker on 4/27/2014 for possessing less than 50 grams of marijuana. Soweto Anderson 33 of Galloway was arrested by Detective Ryan Goehringer on 4/29/2014 for writing bad checks. James B. Woodall 50 of Absecon was arrested by Officer Steve Garrison on 4/30/2014 for Aggravated Assault and Possession of a weapon for unlawful purpose. Laquay R. Hall 30 of Hammonton was arrested by SLEO Kyle Kuhar on 5/3/2014 for Hindering Apprehension. A 15 year old male and a 17 year old male both of Galloway were charged with Possession of Marijuana less than 50 grams, Possession of Drug Paraphernalia and Curfew Violation by Ofc. Carolyn Buckley on 4/24/2014. Two males ages 14 &17 from Medford were charged with possession of 50 grams or less of marijuana and paraphernalia by Officer Dominic Fabrizio on 5/3/2014.